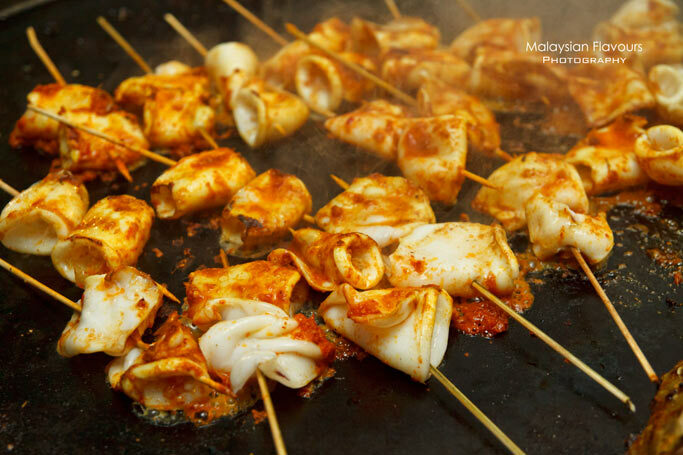 We made a short trip to Putrajaya last Saturday, staying away from the hustle and bustle of KL city. 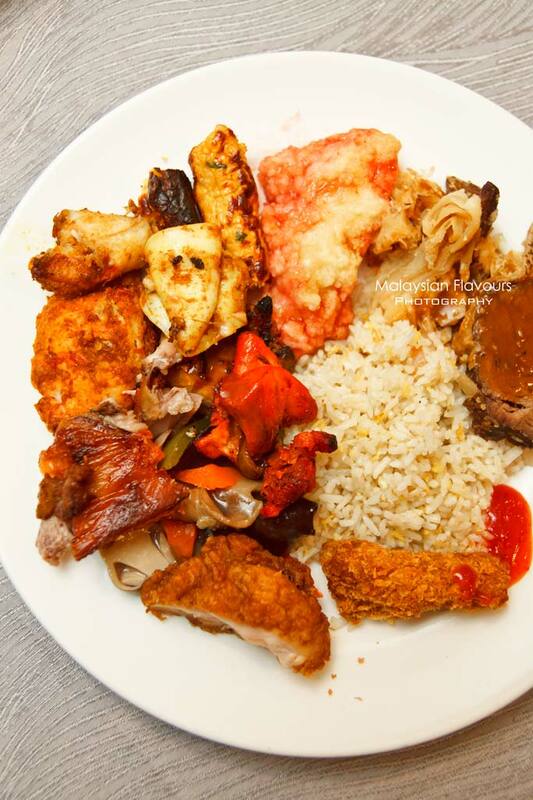 The half an hour drive brought us to Palm Hill Cafe at Putrajaya Shangri-La Hotel, which then drown us with a sumptuous spread of buffet came in myriad of taste and flavours. 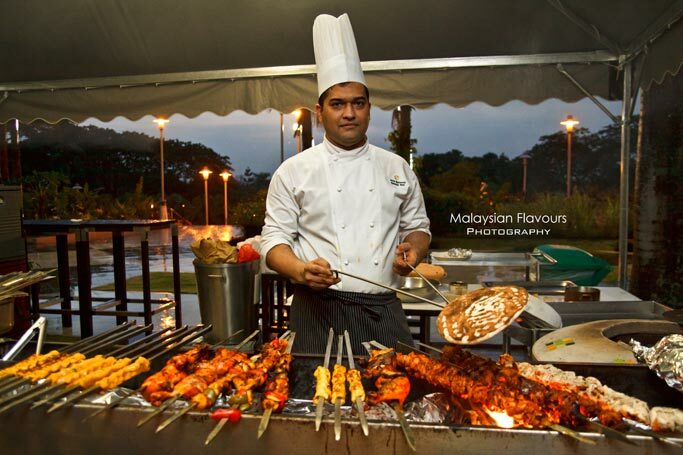 This buffet, themed Saturday BBQ Buffet Dinner is priced at RM110 nett, available on every Saturday. RM55 for children between 6 to 12 years old. 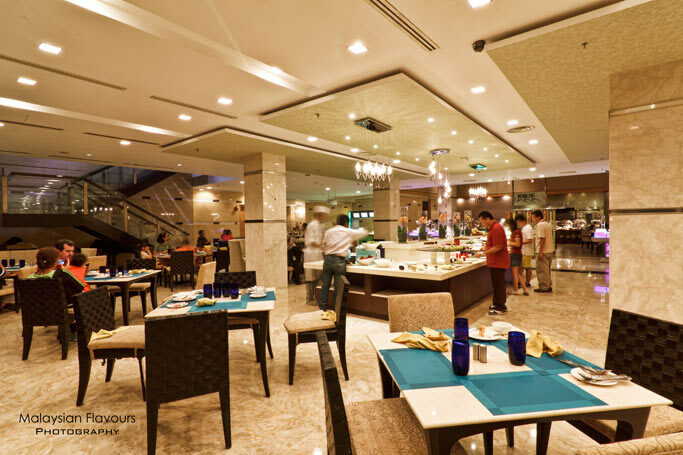 The entire dining area is spacious and elegant, emphasizing on cutting-edge design together with monochromatic scheme to create a relaxing, calm environment- A mix of oak-brown wooden and shiny marble flooring; light-earth tone furnitures; soft hue lights illuminating every corners. 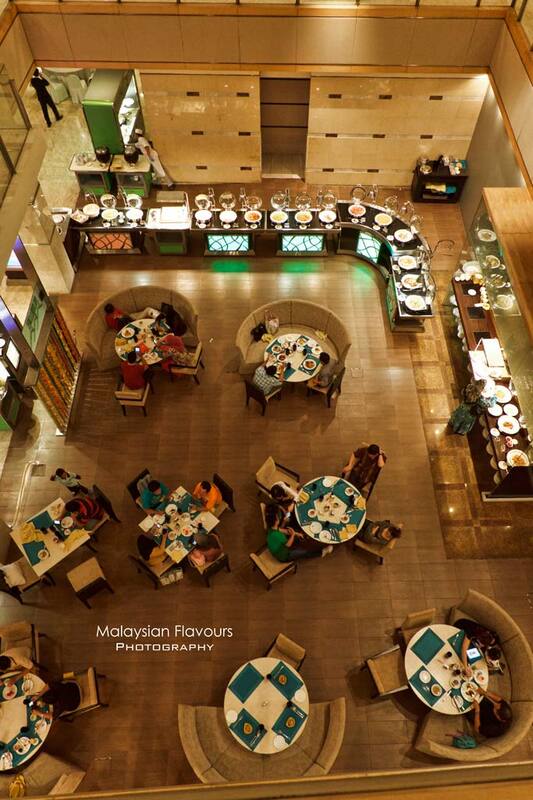 Contrast goes to the green colour table mat, adding a chic and young touch to the entire restaurant. 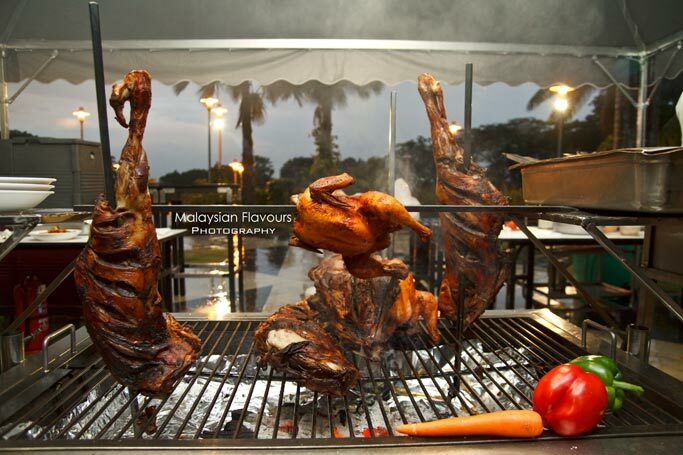 As the buffet name implies, barbecued items are the highlights here. 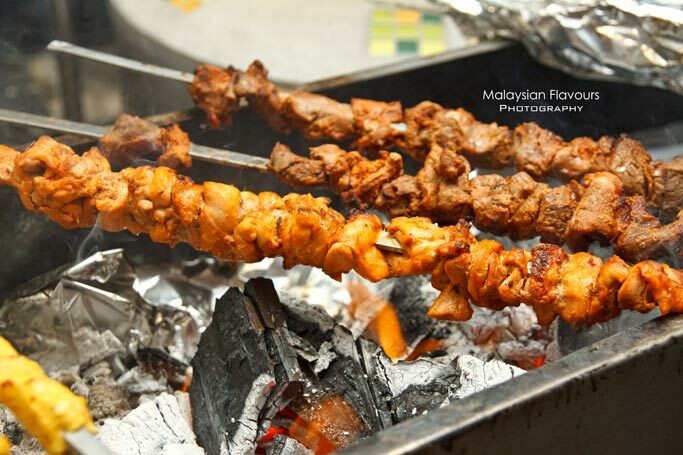 Different kinds of meats are graciously roasted at outdoor BBQ section using charcoal, so welcoming with pleasant aroma filling the air. 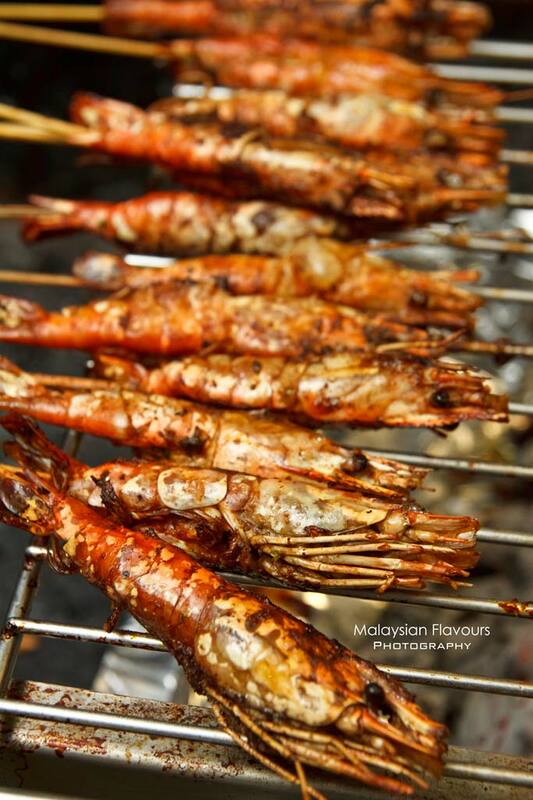 ..continue with seafood such as Grilled Tiger Prawns with Pandan flavour, beautifully grilled at minimal marination to retain the original sweetness and juiciness; or Grilled Squid that is thickly slathered with pungent, appetizing sauce..
Grilled chicken legs and meat skewers look equally alluring, barbecued till char at the edge, rendering extra smoky sensation. 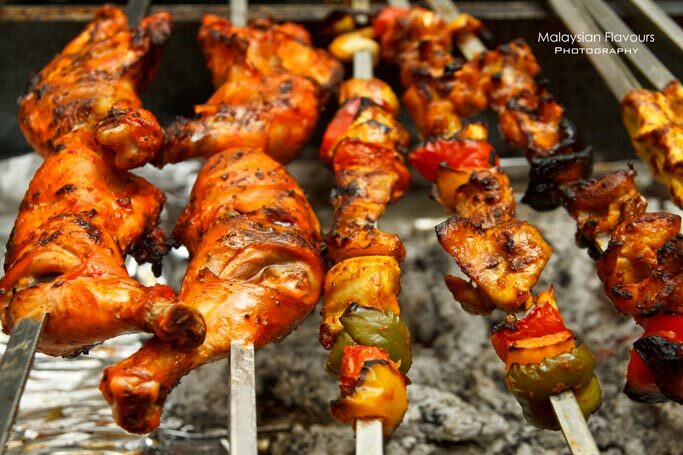 Grilled Lamb Seekh Kebab, Chicken Rashmi Kebab, Chicken Malai Boti, Grilled Chili Marinated Pomfret, Grilled Cajun Beef with Mushroom & Capsicum and more are awaiting you at the counter to pick them up…Pair them with Naan bread, garlic naan bread or cheese naan bread fresh from the stone oven. 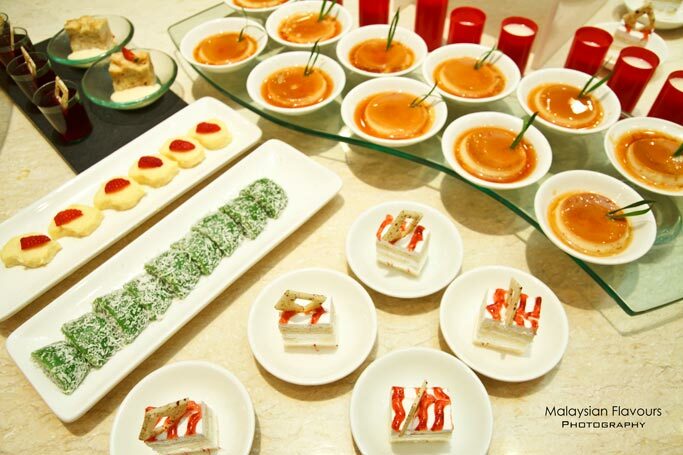 Apart from that, the buffet also offers a complete selection from starter, main dishes to dessert. 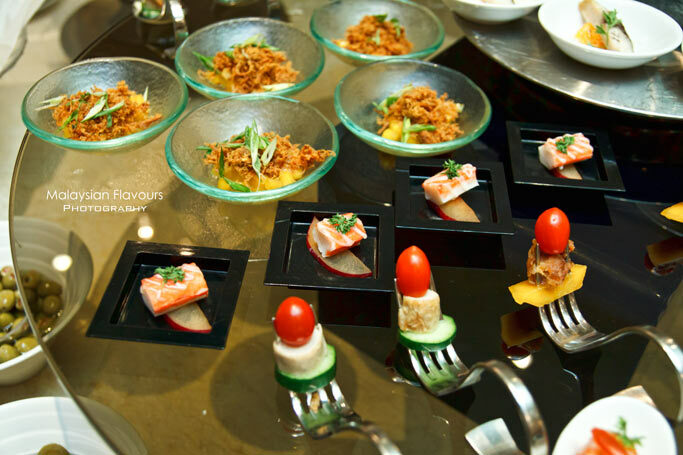 Spoilt yourself with appetizers such as Grilled Cherry Tomatoes Salads with Basil Vinaigrette, Jelly Fish Salad with Soya Dressing and Sesame Seeds, Roasted Chicken with Thai Mango Salad, Tuna Nicoise Salad and Italian Pasta Salad, just to name a few. 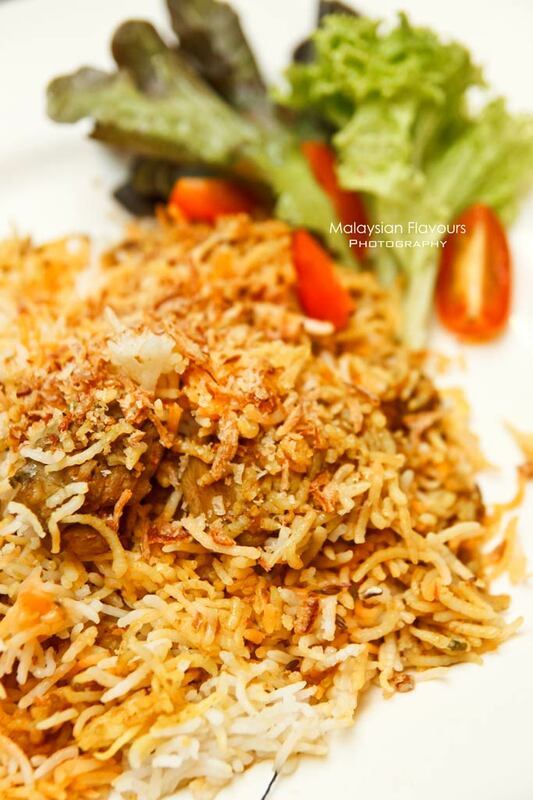 Palm Hill Cafe is prides for their Nasi Biryani, featuring fluffy soft rice distinctly flavoured up with rich aroma of spices. Same goes to the Lemon Rice, which is also noteworthy. 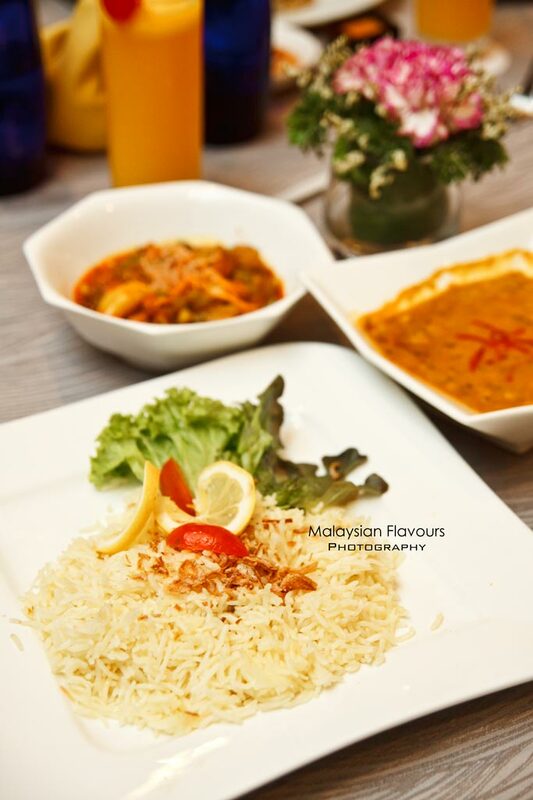 The usual, drab white rice goes through a slight makeover to lend a faint hint of lemony fragrance to the palate. The list continues to count. 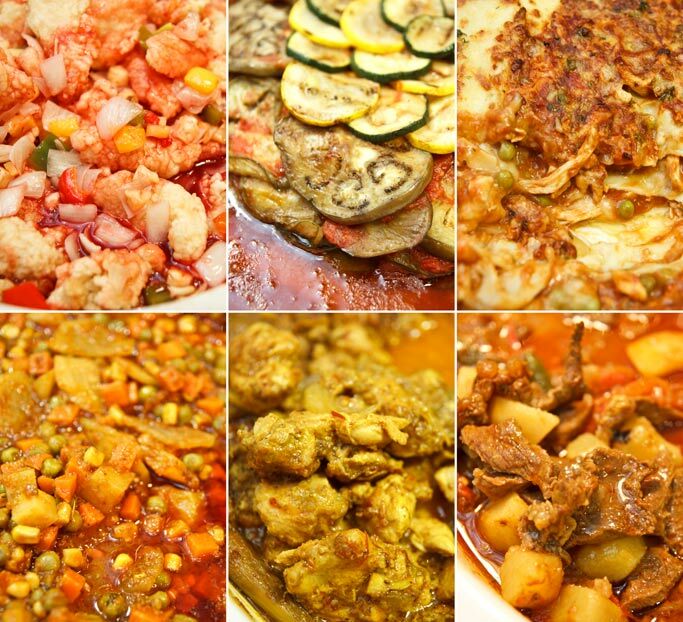 Chinese Fried Rice, Chicken Biryani, Indonesian Beef Curry with Potato and Green Chilli, Deep Fried Seabass with Pineapple, Sweet and Sour Sauce, Loh Hon Chai with Crabmeat, Baked Egg Plant with Spicy Tomato Sauce, Gratinated Potato with Cheese, Chicken Lasagna, Beef and Chicken Satay and Baked Beef Wellington are among the hot dishes available. Save some rooms for dessert. 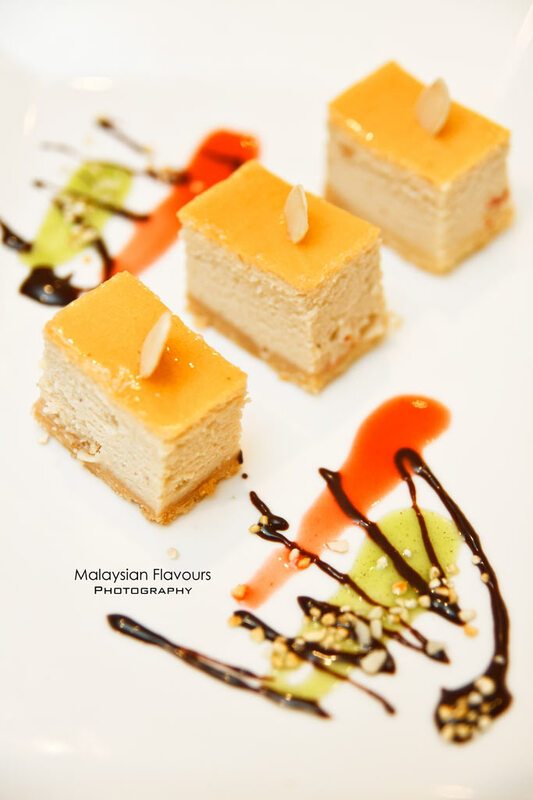 The Teh Tarik Cheesecake is the creative creation by the chef, must-try in Palm Hill Cafe Putrajaya Shangrila. While the cheesiness and creaminess of cheesecake still take more steps than the flavour of Teh Tarik, we suggest diners to slowly tuck in this dessert, bit by bit to get the flavour of teh tarik develops in your mouth. 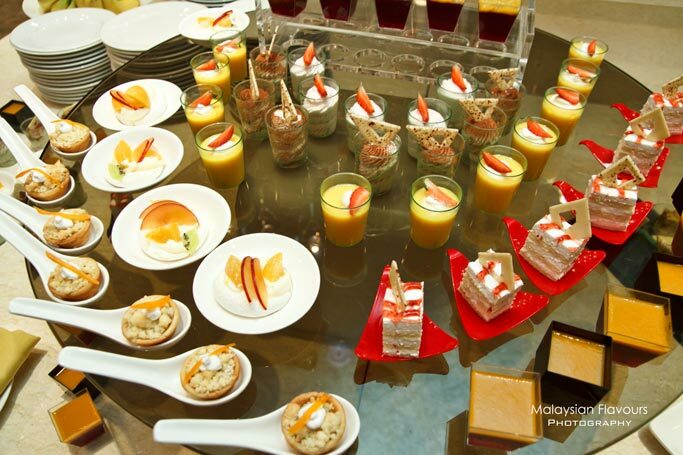 Mocha Tiramisu, Cheese Cake, Tiramisu with Dusted Sponge Finger, Dark and White Chocolate Mousse, Bread Pudding, Strawberry Macarons, Hazelnut Pudding with Coffee Syrup, Mango Tarte Tartin with Lime Syrup, Strawberry Short Cake, Orange Layer Cake, etc all lined up colourfully at the dessert counter. 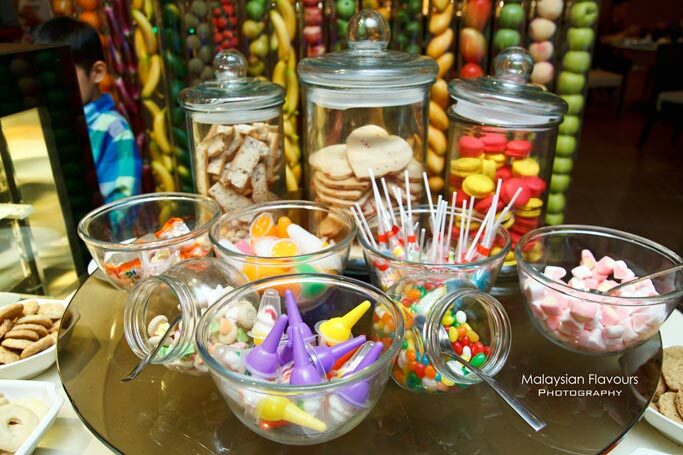 Marshmallow, jelly, M&M, biscuits, Palm Hill Cafe counts on sweet treats for your kids too. 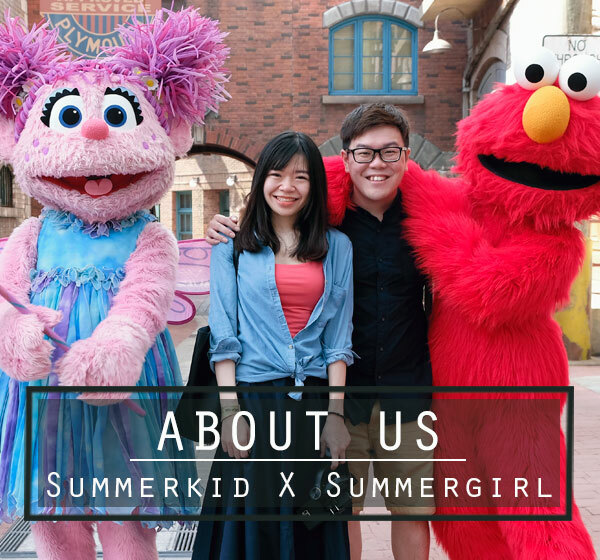 any discount for us if have up to 10 peoples?